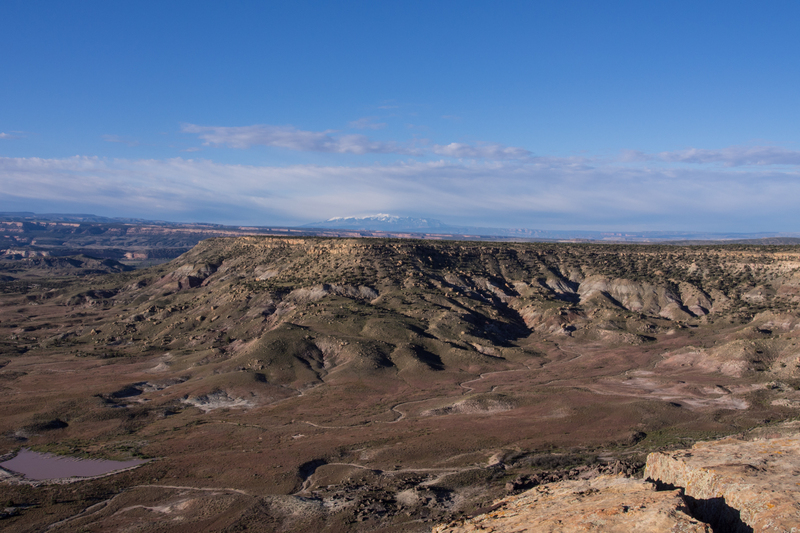 We had been thinking about Kokopelli’s all winter, after all it’s practically in our backyard, and is supposed to be an epic mountain bike route through spectacular scenery. 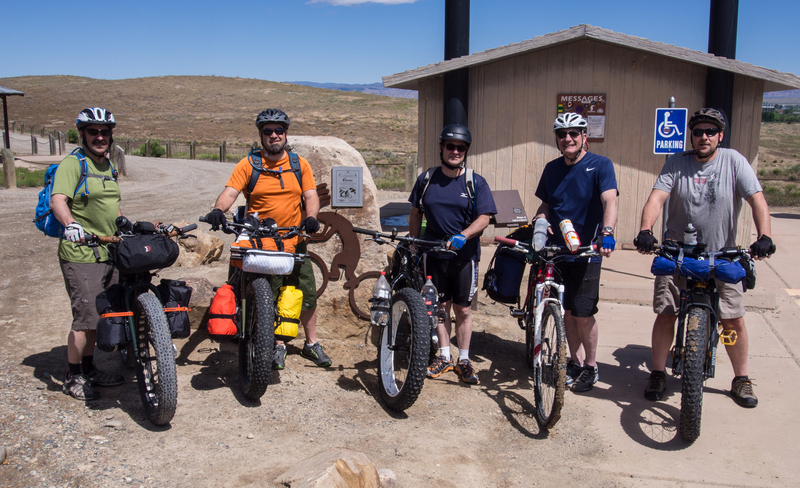 We rode regularly through the winter, with many trips up to the groomed trails in American Fork Canyon. Spring wasn’t quite as productive with all the rain we had, which meant muddy trails. We planned a four day trip during the second week of May. 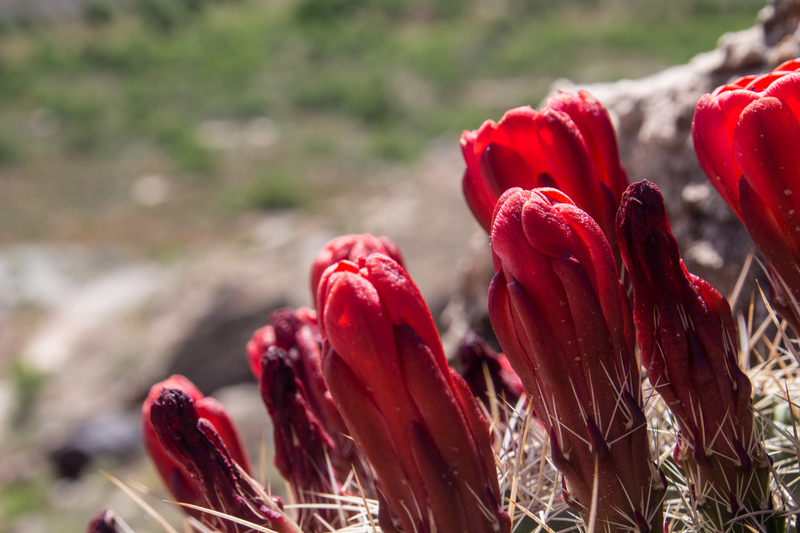 The week before it rained heavily, which made for ideal conditions out in the desert, with mostly firm trails. Originally it was just us three brothers, then we talked our friend Jess into joining us. Good thing, as he did the bulk of the route finding with his excellent GPS skills, which the three of us lack. 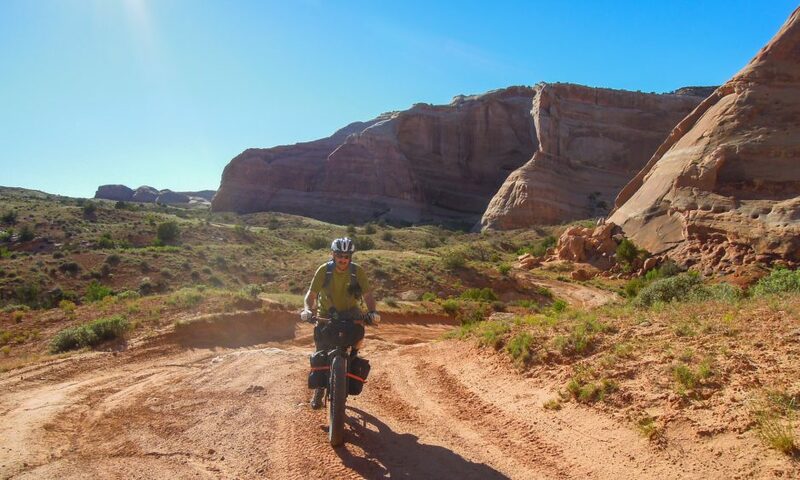 As departure time approached, Jess recruited a friend of his to join us—Richard, a veteran of many long road tours, including two cross country tours, a ride to Alaska (from Utah), and a ride down the West Coast. Jess also recruited his dad to bring his jeep along to drop water for us at a few locations. 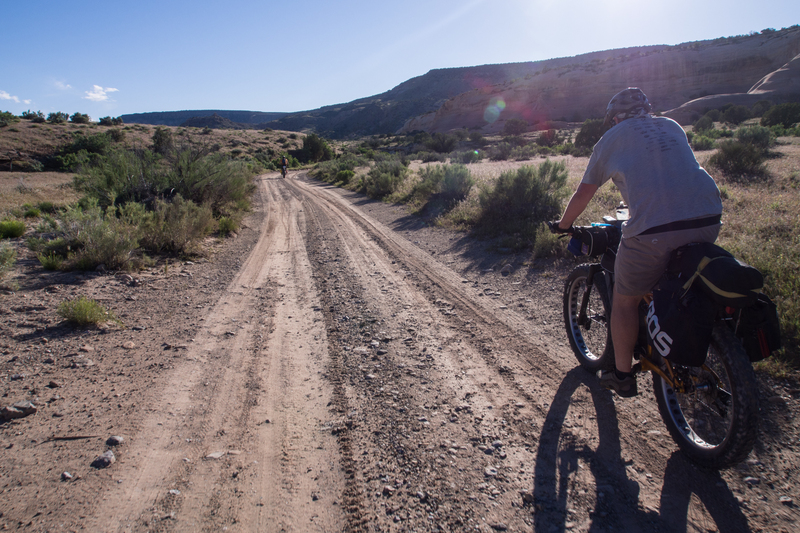 On the way down Bullet realized that he forgot his shoes/cleats, so we made a stop in Fruita at Over the Edge Sports so he could pick up a pair of platform pedals (which he was later very glad he had). We also had excellent breakfast burritos next door at Aspen Street Coffee. 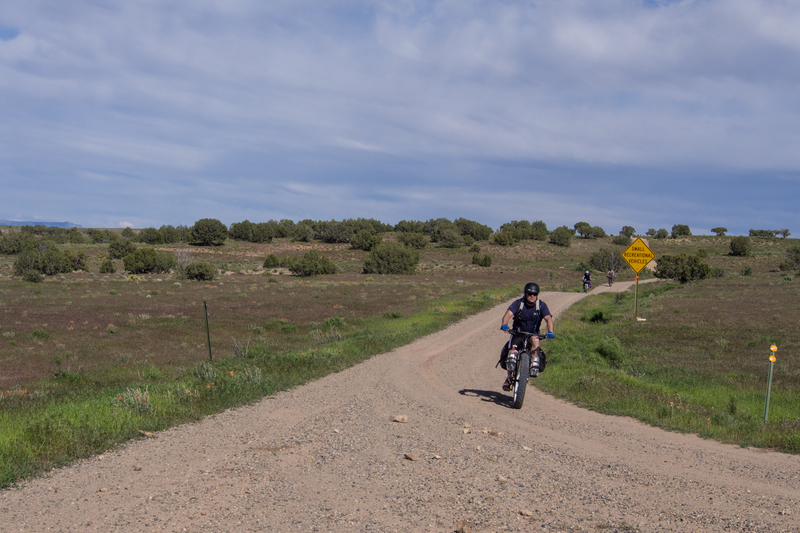 We then headed out to the trailhead in Loma, and finally were riding by 11:30 am. Our goal for the day was Bitter Creek Campground, about 35 miles away. Here are the loaded bikes. 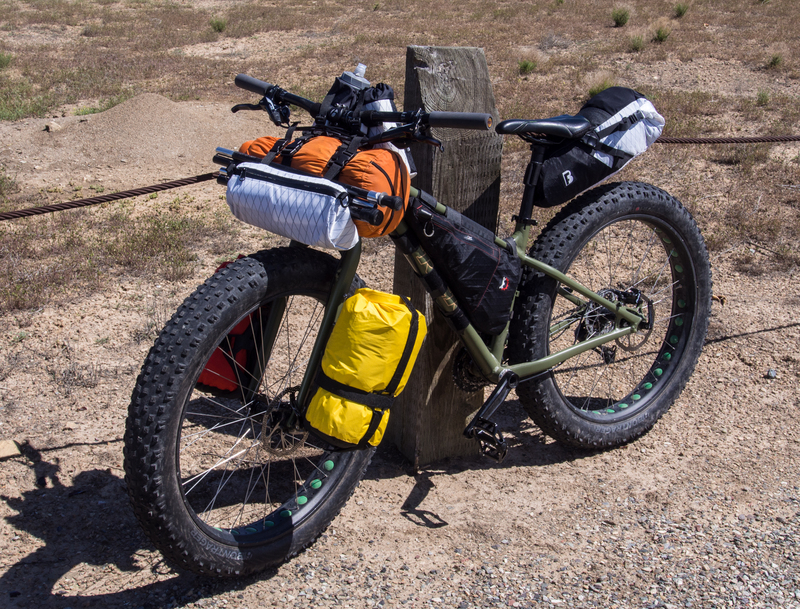 My Surly Pugsley, Wilbur, with mostly Revelate bags, and a Lone Peak seat pack. I must not have taken any photos of Richard and Jess’s bikes. Jess was riding a Salsa Bucksaw, full suspension, with custom Barfly frame packs (one in the triangle and the other on the downtube) where he carried the bulk of his water. 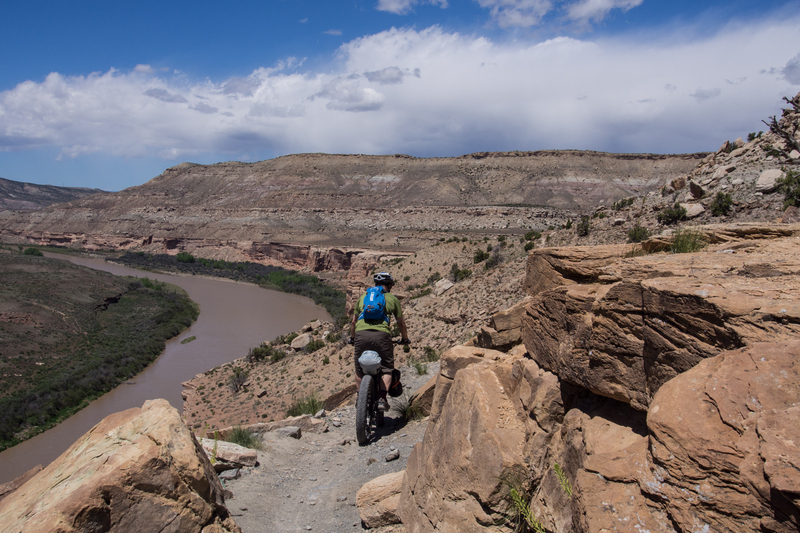 Kokopelli’s Trail begins on the excellent Moab-like singletrack trails along the Colorado River in Loma, Colorado. 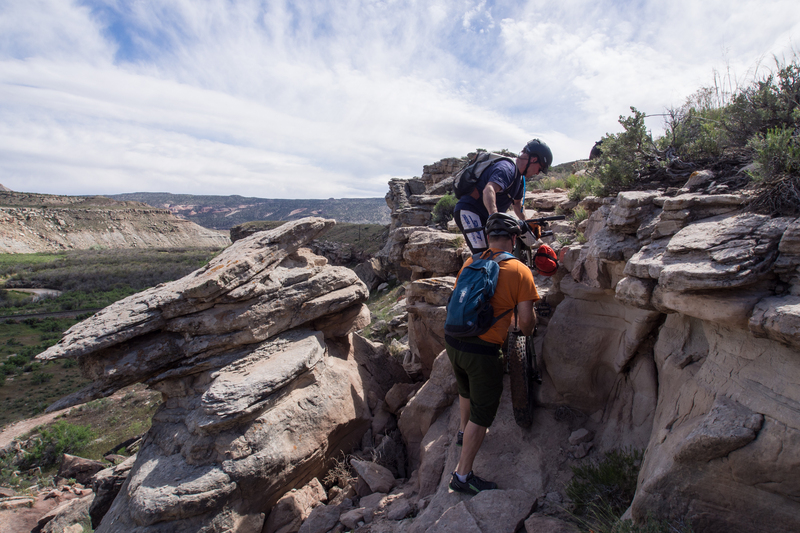 The Trail begins with 13 miles of fairly technical singletrack on Mary’s Loop, Lion’s Loop, and Troy Built Loop. The first couple miles we stopped a few times adjusting packs and straps. 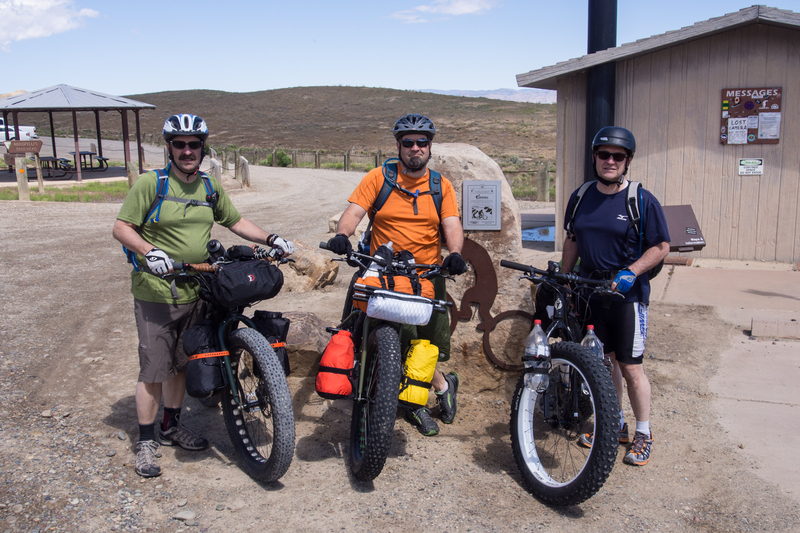 Richard was the only one not on a fat bike, riding an aging Trek mountain bike with a rear rack. 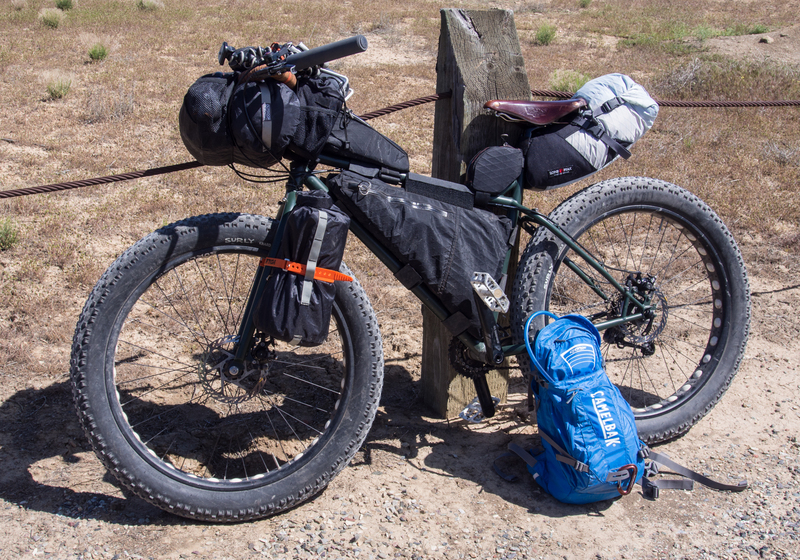 He had the bulk of his gear in a pair of panniers on a rear rack. 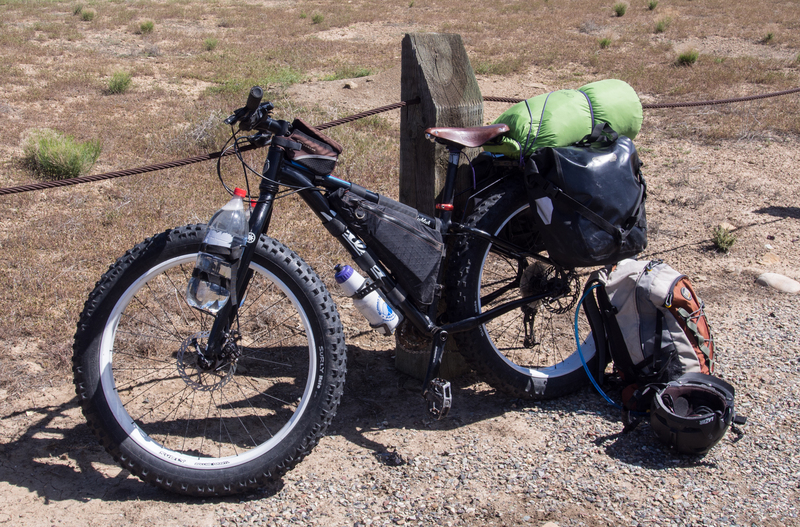 This proved to be very strenuous on the steep hike-a-bike sections, not to mention that one of the hooks on his panniers deformed. 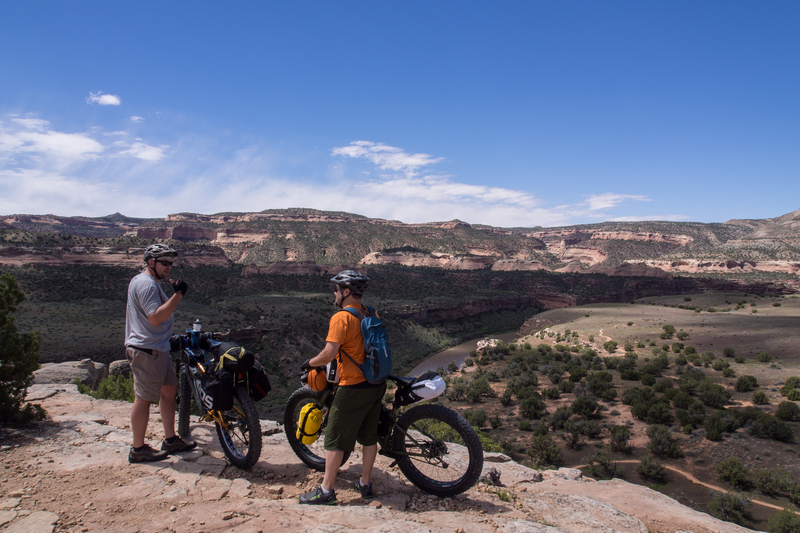 The riding was beautiful, winding along the rim of a red rock canyon overlooking the Colorado River. We wound in and out of small drainages with several steep hikes up rocky inclines. 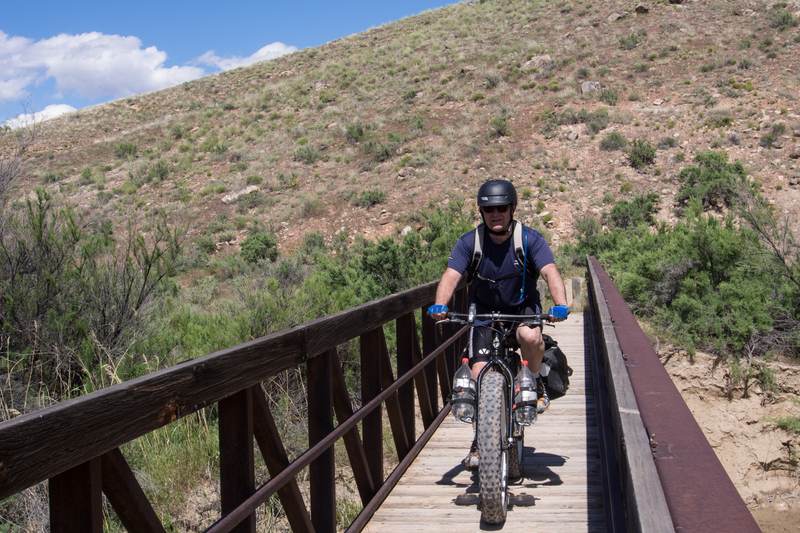 The trail worked its way up Salt Creek, then dropped down a very steep trail to a bridge across the creek. 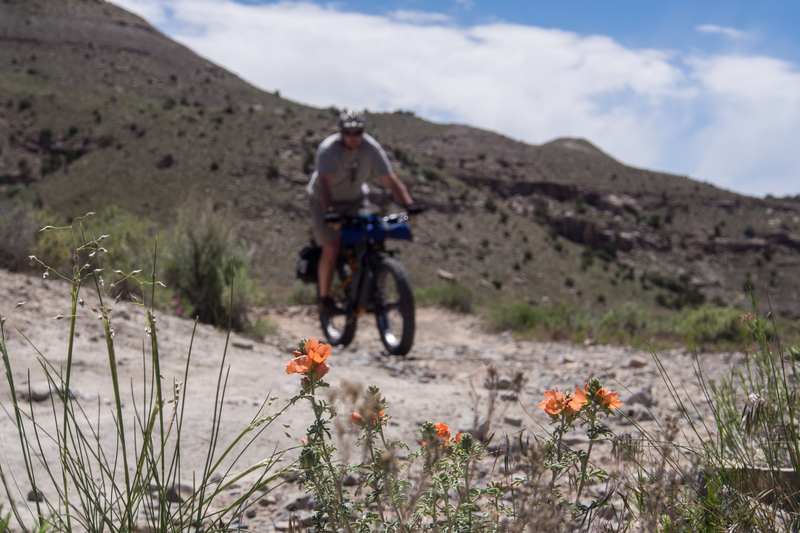 This was followed by a steep, rocky hike-a-bike that seemed to go on for a long time. 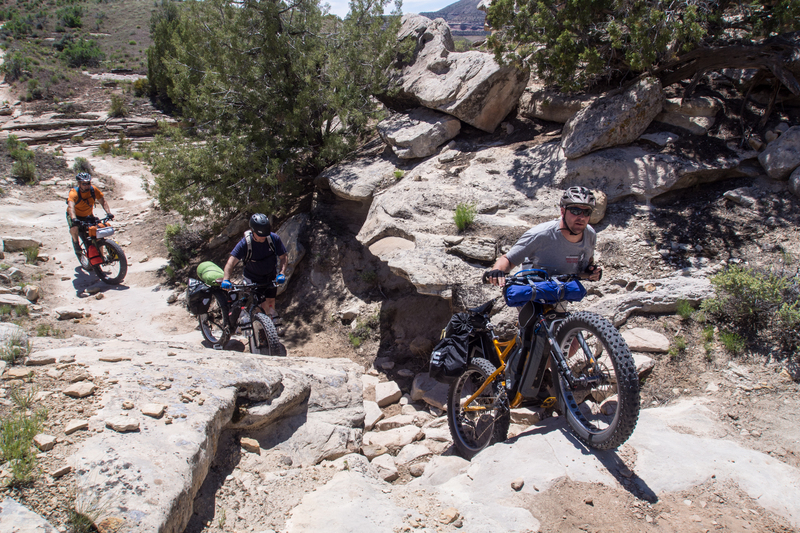 When we thought it was nearly over, we had steep chunky ledges we had to lift our bikes up and over before finally topping out on a ridge. 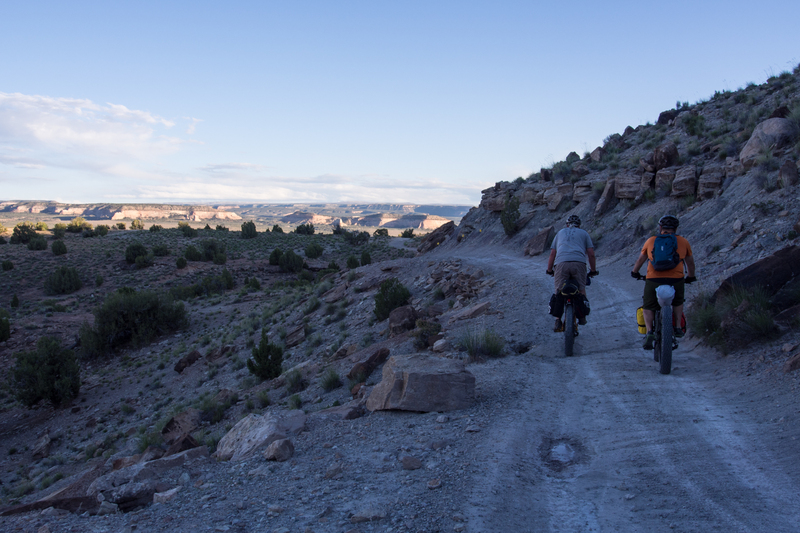 After more climbing we finally topped out on a long sage brush covered saddle and began our descent into Rabbit Valley. 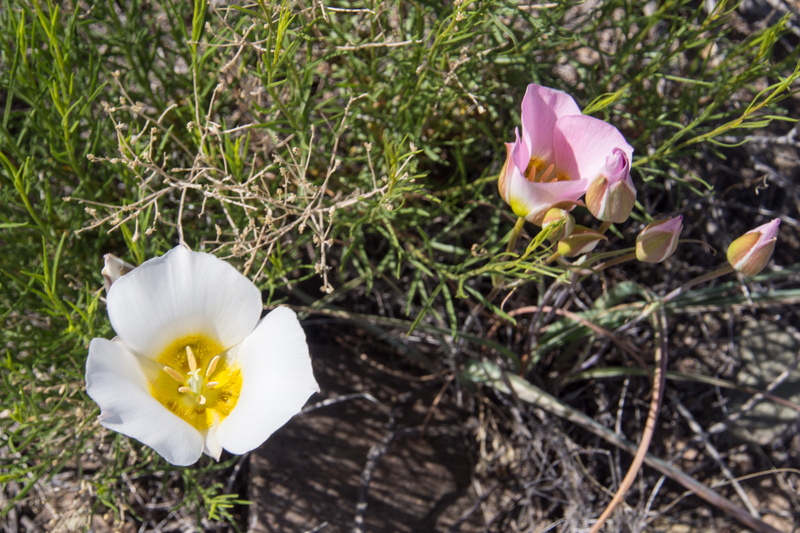 Because of all the rain the week before, the desert was exploding with wildflowers in almost every color. 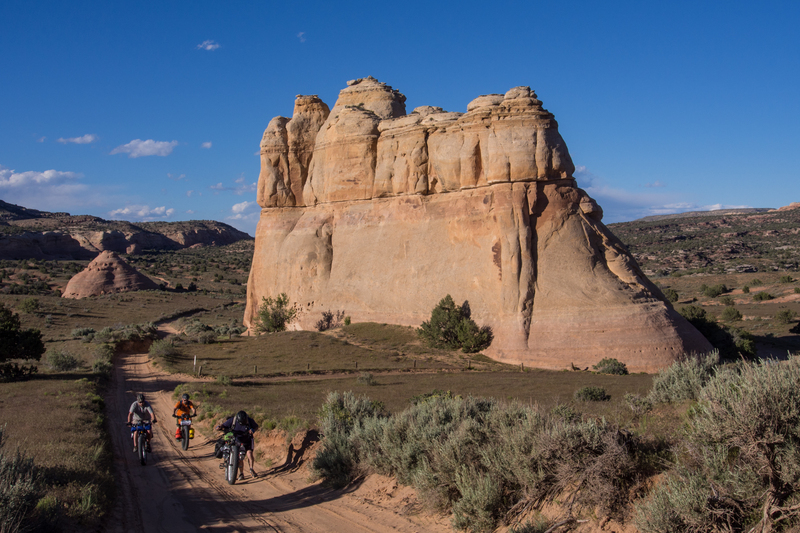 The miles went much faster through Rabbit Valley. The climbs were reasonable, the descents fast and enjoyable, and the scenery still spectacular. 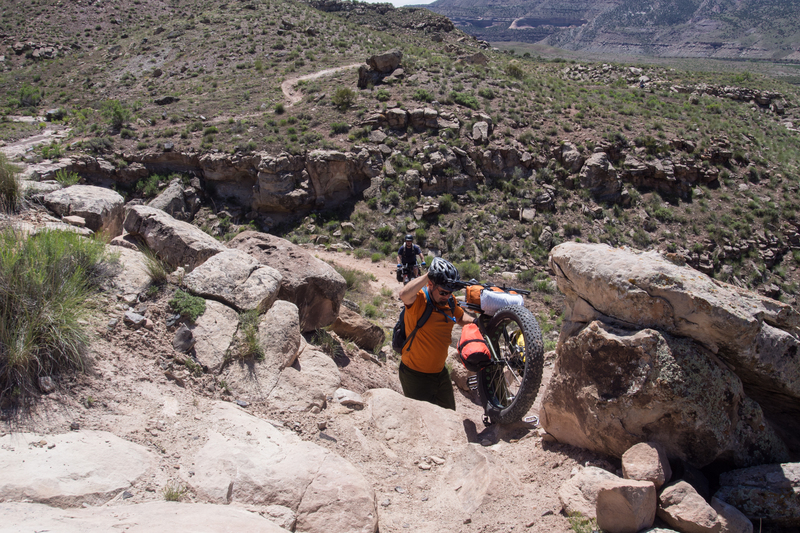 Back in the technical, rocky singletrack, Richard had crashed a couple times and blew out his knee. He was in quite a bit of pain and it was obvious that he would be bailing as soon as we could contact Jess’ dad Boyd in the jeep. 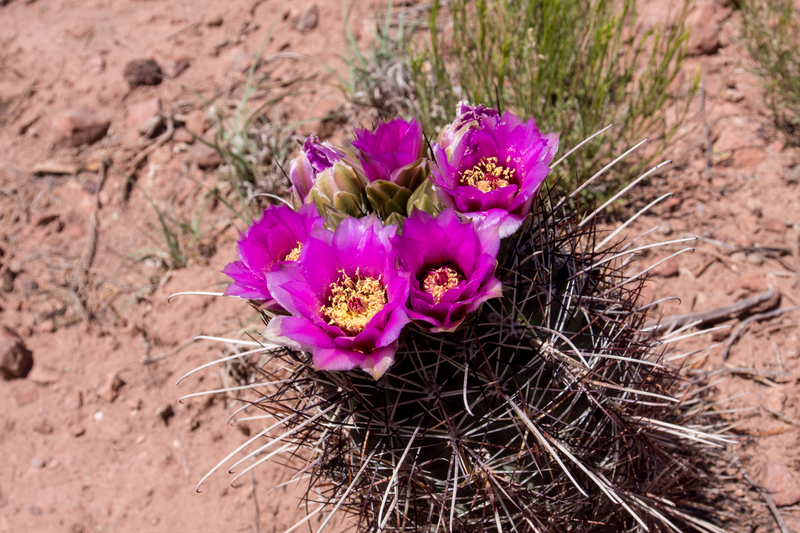 They arranged to meet up at the Rabbit Valley Trailhead, and Boyd drove him to Green River where he got a room for the night and waited for someone to pick him up the next day. We were sad to lose Richard. 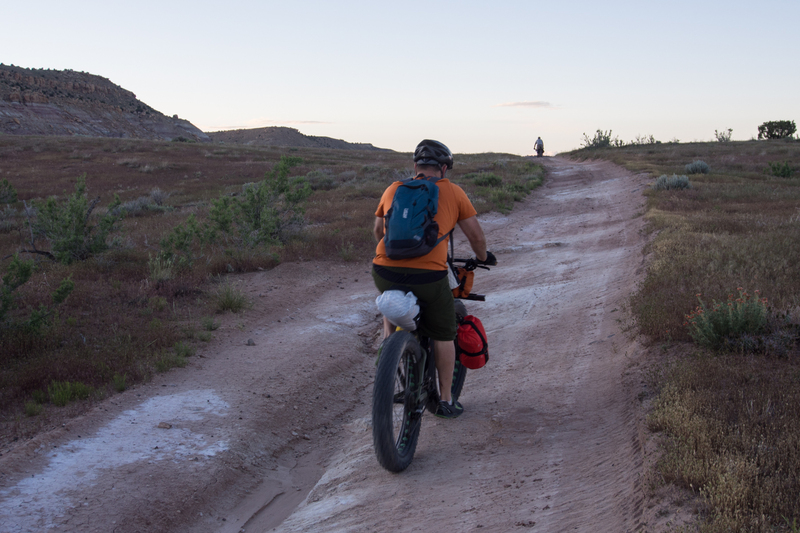 The trail through Rabbit Valley was often sandy but with our fat tires, we glided over hardly noticing. 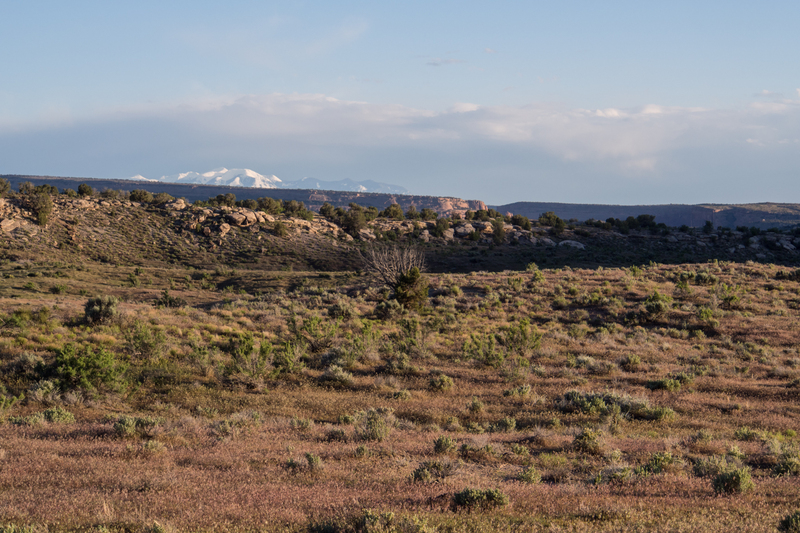 With our late start, the sun began setting as we passed a few campgrounds in Rabbit Valley. We were also feeling the miles in our legs. At one point a few miles before Bitter Creek, we observed a bald eagle high up on rock, just scanning the valley below. Through this area we had stiff, cold headwinds as well, which took something out of us. In fact, we had pretty strong winds the last 8 or 10 miles of the day. Riding in the shadows near the end of the first day. 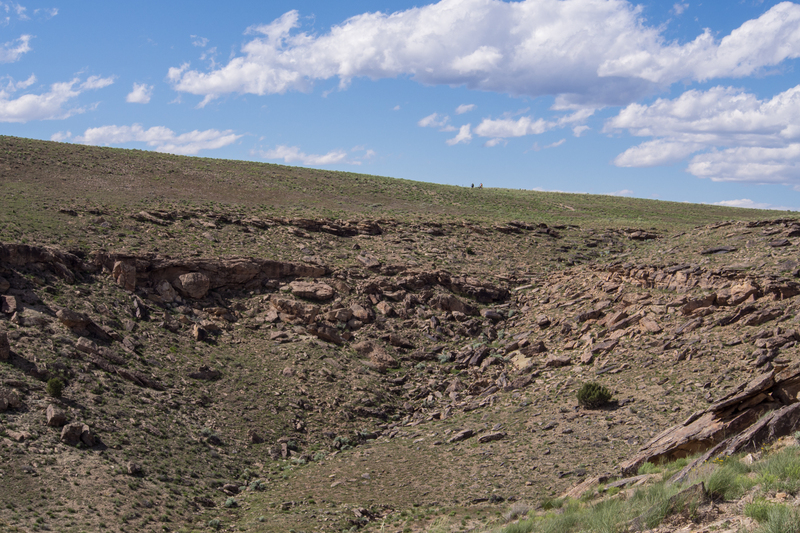 Bitter Creek Campground sits at the top of a plateau at just over 5000′. 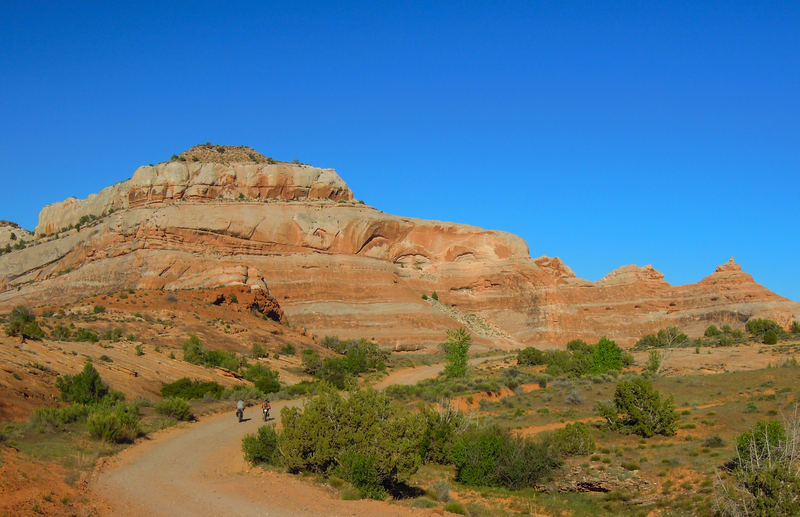 We turned a final corner around this massive butte to see this insanely steep jeep track angling up the side. That was our route, and it meant a steep hike gaining 400′ in probably just a quarter mile or so. Jess is the strongest climber and he arrived at the top first, followed by Bullet and I. Doc was still down below somewhere. By the time we topped out, it was dusk and we were pretty wiped out. We followed the sign to the campground and after winding all the way around the plateau on singletrack we found the campground where Jess was unpacking his gear. As it got darker, Doc still had not arrived, but we figured the sign was pretty obvious pointing the way to the campground so we weren’t too worried. After it was pretty dark, I unloaded my bike, put my light on, and rode out to look for him. 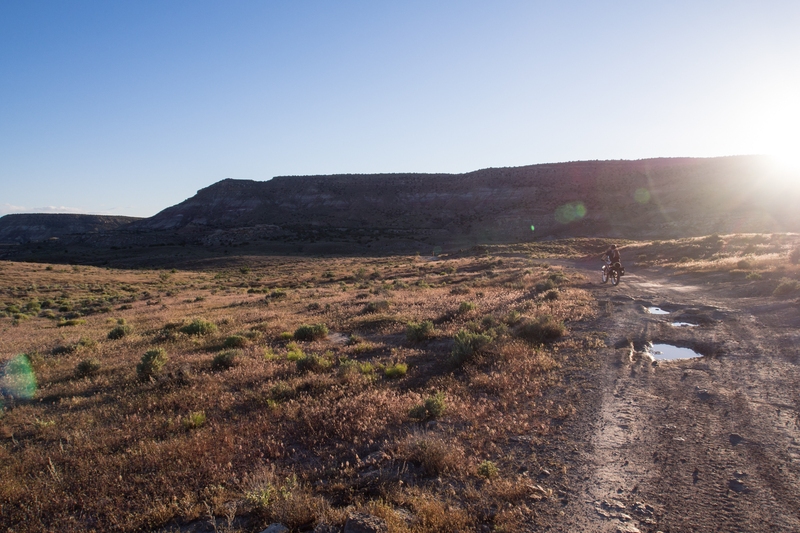 Just as I began heading down the road I could see his light, and the lights of Boyd’s jeep headed in our direction. By the time Doc had topped out it was dark and he missed the sign and was headed in the wrong direction. Luckily Boyd came along in the jeep and turned him around. 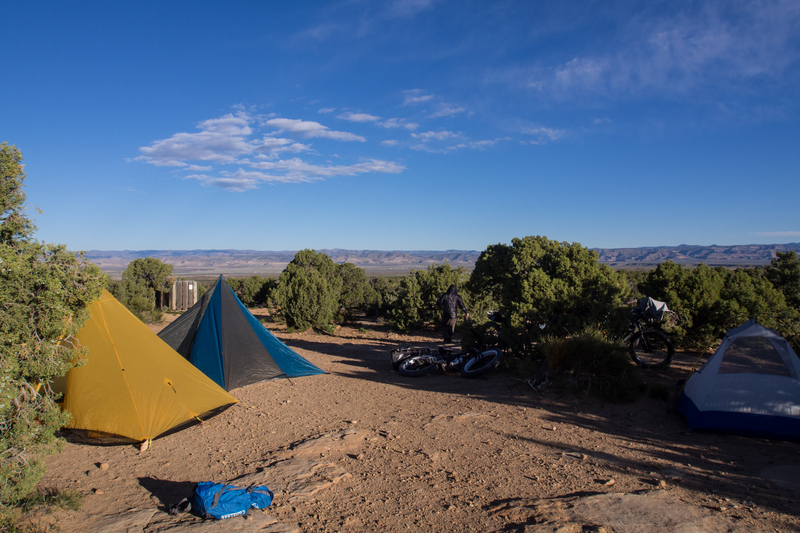 He told us he was ready to call it a day and set up camp alongside the trail. It was cold and windy on the top of the plateau and we were really tired. We had been on the trail for about nine hours, which was quite a bit longer than we anticipated. 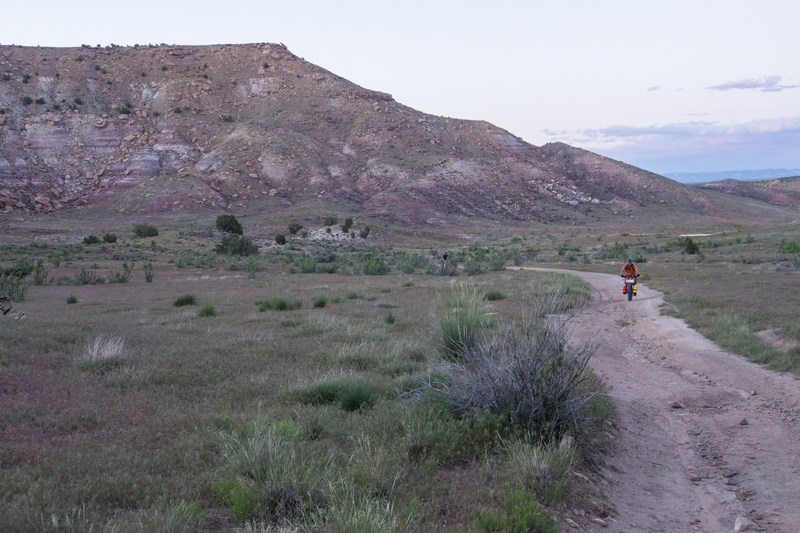 There was also more hike-a-bike than we were anticipating, which slowed us down. 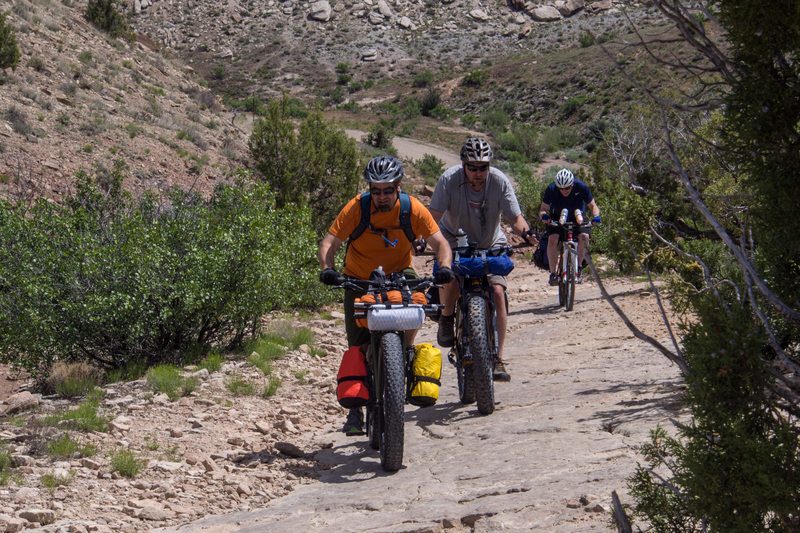 Not only were our legs very tired, but our upper bodies were pretty beat from pushing our loaded bikes up steep climbs. Because of the wind, we set up tents, cooked dinner, and went to bed. 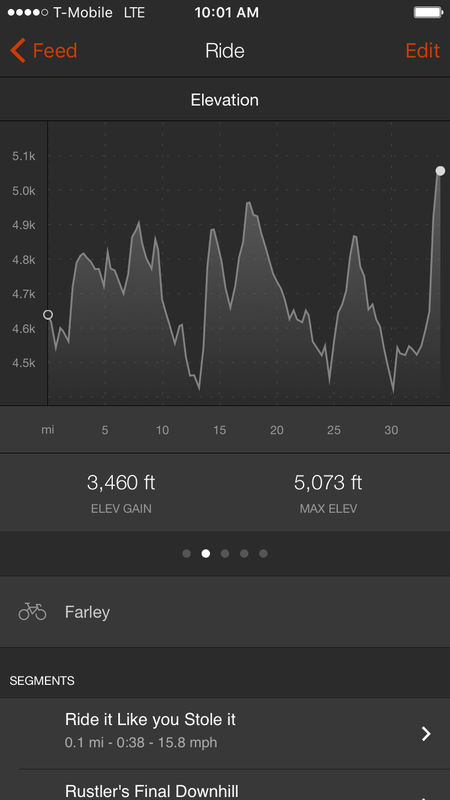 Day One totals: 34 miles; 4384′ of elevation gain (according to Jess’s GPS); here is a screenshot of Bullet’s Strava recording.